The seminal series' spin-off story recounting how the mightiest warrior in the universe built his arsenal of war. 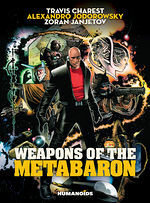 The creative trio of Jodorowsky, Charest, and Janjetov shows us how the Metabaron assembled the galaxy’s most powerful and destructive weapons in an effort to secure his position as the universe’s ultimate warrior. Travis Charest's (Artist of Wildcats, WildC.A.T.s/X-Men: The Golden Age, and Star Wars comics Cover Artist) interpretation of 'The Metabarons' mythology. 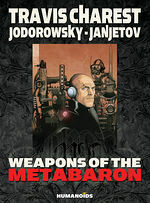 Jodorowsky is always a wacky time and this is some of Travis Charest’s best work.